There are a number of reasons why hair loss and hair thinning can occur in both men and women, whether it be through alopecia, illness, genetics, hormones or vitamin deficiencies. Statistics show that 8 million women in the UK alone experience hair loss, while male pattern baldness affects around half of all men and Alopecia Areata can affect 2 in every 1,000 people*. With stats like these, there is a large market of people looking for hair loss/hair thinning friendly salons. Are you a hair salon, beauty salon or barbershop owner wanting to expand your services into helping clients who have experienced hair loss? Whether you’d like to offer help and advice, specialised treatments, or expand your range of hair thickening shampoos and enhancers dedicated to people with hair loss, we hope today’s article will offer you a place to start. 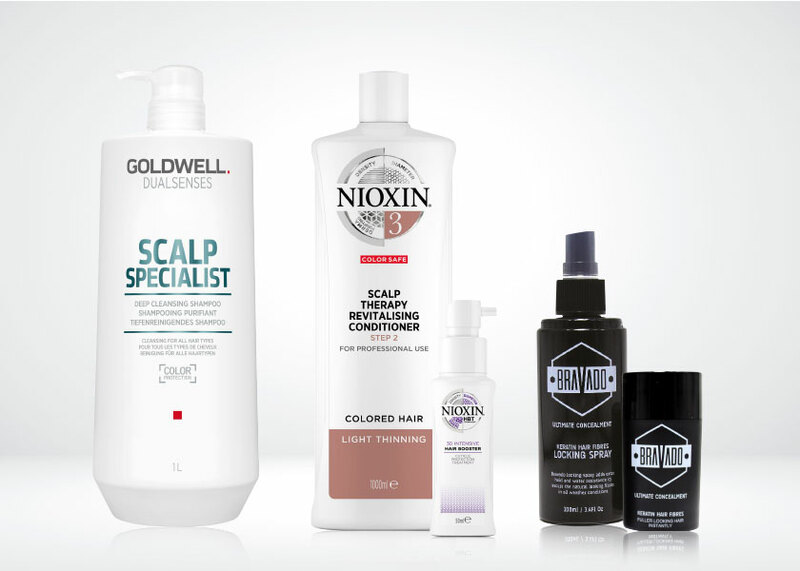 Clients with thinning hair can be treated with Nioxin hair products – The world’s best-selling salon brand for thinning hair. Nioxin’s specialist technology allows you to help your clients achieve thicker, strong, better quality hair. Choose from our range of treatment products for the different stages of hair thinning. Whether you’re looking for the Nioxin Trial Kit System 4, which helps clients who have thinning, chemically altered hair, or the Nioxin Trial Kit System 1 for clients with noticeably fine hair, we have a Nioxin product for everyone. Hair fibres are a great way to help clients achieve thicker looking, fuller hair – particularly if the hair is noticeably thinning or is naturally very fine. The Bravado hair fibres range is made from the highest grade natural keratin which has the same genetic profile as the protein found in human hair, ensuring a natural look. We also offer the Hair Sculptor, hair building fibres for both male and female clients. These natural fibres cover the scalp and adhere to thin hair to make it look thicker and more natural, a total confidence booster for your client! The Goldwell Dualsenses Scalp Specialist Deep Cleansing Shampoo offers clients a clean and fresh scalp, whilst removing product build-up and styling residue. This specialist hair care treatment is absolutely ideal for clients with a sensitive scalp and/or thinning hair. Hair loss doesn’t just affect the hair on our heads, it can also affect the eyebrows and eyelashes. With this in mind, beauty salons can also help clients with facial hair loss/hair thinning feel confident through the art of makeup. One way of doing this could be to offer makeup lessons to clients who want to learn to shade in their brows or give the illusion of a lash line. You could also go one step further and market your salon towards makeup for clients with hair loss for special occasions such as weddings or proms. The Marvelbrow Brow Pencil is a super pigmented pencil that allows you to not only just fill in sparse areas of the brows, but also shape and outline where a natural brow would sit. We stock a fantastic range of colours including mid brown, blonde and black. If you’re looking for mineral oil free powder brow products, look no further than Wow! Brow Eyebrow Products. These seriously soft micro-fine powders are water resistant making them an ideal choice for sculpting brows from scratch, or when there is very little hair to work with. Want more information on hair loss? Shop hair thickening shampoos and enhancers online or view the full range of hairdressing supplies at Salons Direct! Time for more from Salons Direct? Which beauty products are going to be successful in 2019?